We offer Reduced Fare Breeze Cards to eligible senior citizens, people with disabilities and Medicare cardholders. 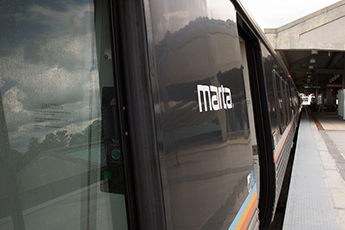 It is part of making MARTA a transit system everyone can use. 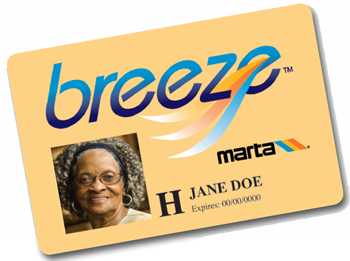 These discounted Breeze Cards are valid on all MARTA buses and trains. A SENIOR CITIZEN age 65 or older, must provide valid photo ID with date of birth such as a driver’s license, state issued identification or passport. Please note that all documentation must be accompanied by a valid photo ID. How much does a Reduced Fare Breeze Card cost? The initial card is free, and your first replacement is only $2. All future replacements are $5. Is there a Reduced Fare monthly pass? We do not offer Reduced Fare versions of any of our pass programs. The Reduced Fare pass is only compatible with oneway tickets, round trips and trip packages in multiples of 10 or 20. You can also load stored value (cash) at the cost of $1 per trip. When does my Reduced Fare Breeze Card expire? The documentation required for Reduced Fare eligibility will determine the certification period, up to a maximum of three (3) years. The eligibility expiration date is printed on the front of the Reduced Fare Breeze card. When you tap your card at the rail station fare gate or at the bus fare box, your card expiration date will appear on the display, you can also check the expiration date of your card at a Breeze Vending Machine. Please note: When your eligibility expires, you’ll have to provide current documentation of eligibility in person to recertify for Reduced Fare eligibility. How do I use my Reduced Fare Breeze Card? Your Reduced Fare Breeze Card functions the same way as any other Breeze Card. Simply tap your card on the Breeze target wherever your riding. In some cases you will have to show your Reduced Fare Breeze Card to MARTA employees such as bus operators and rail station agents. Also, only you are allowed to use your Reduced Fare Breeze Card. If anyone else is caught using your card, the card will be confiscated — and you will have to wait a minimum of 30 days before receiving a replacement.